The illuminating LEDs in the unit are RGB meaning that the colour of the sign can be selected on installation. As standard, the sign will illuminate in defined colours when control inputs 1 and 2 are used, but you can configure the sign to display one of 9 colours using the LD-RPC remote controller: white, green, red, brick red, blue, yellow, orange, cyan and magenta. The images on the following pages show the default colour of each sign. The sign can be controlled by either, or both, of 2 pull-low inputs, e.g. 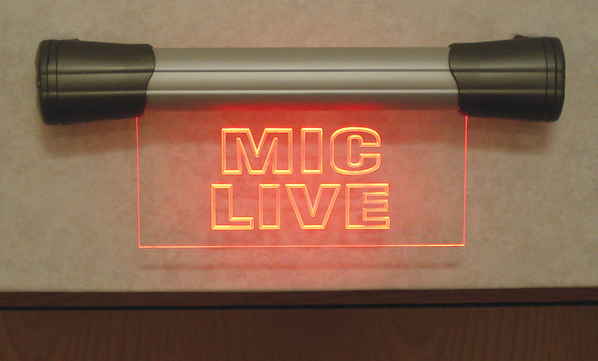 a single input can be used to control a single ‘MIC LIVE’ sign, or 2 inputs can be used to control a twin ‘TX’ and ‘REH’ sign with independent control of each side of the sign. For a small additional cost, the SignalLED main circuit board can be modified to accept a DC input in the range 7V-36V, for example, if you have a 12V or 24V distributed DC power network. Please note that for 7V – 36V ‘LDD’ orders, a DC power supply is not included as standard. Add the item LD-DC to your order. Each sign is 40cm or 20cm long. The 40cm signs can be split into two 20cm sides which can be separately, or jointly controlled, e.g. 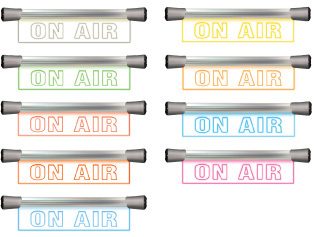 you can have a 40cm ‘ON AIR’ sign, or twin 2 x 20cm signs, such as ‘ON AIR’ and ‘MIC LIVE’. The sign is supplied as standard so that it can be mounted flush to a wall, e.g. for the ‘TX’ & ‘REH’ sign shown. However, a mounting kit is available, LD-KE1, to mount the sign perpendicular to a wall, e.g. above a door, such as the ON AIR sign shown. 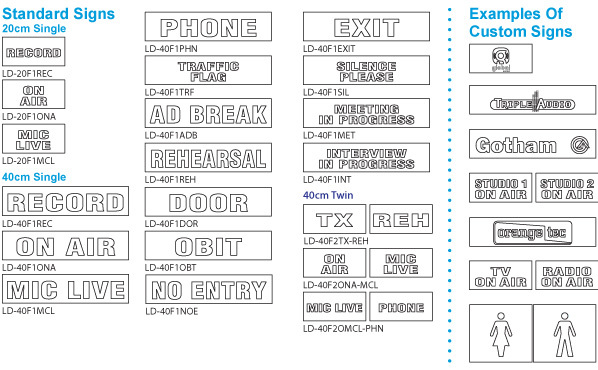 These are the available choices for the smaller 20cm flush-mounting signs. Custom signs can be made to order, if required. Although a range of standard signs is supported, custom signs, for example with your company name or logo, can be produced for a nominal setup fee. Contact Sonifex with your requirements. If wish to supply your own artwork for the custom sign, please read the Customer Supplied Sign Artwork Specification > . The signs are supplied with a 6V wall-wart power supply with international adapters for the UK, Europe, USA and Australasia & a 5m lead. Simply wire up your control signal(s) and DC input to the ‘screw terminal block’ inside the sign, route the cables through the integral cable clamp and mount the unit on the wall. LD-IT An installation tool, the LD-IT can be used to hold the sign in place on the wall mount whilst you wire it up. Just select the name of the sign from the list above.